Through November 22nd at The Kraine Theater: The world premiere production from the team that brought us Bedbugs!!! of Paul Leschen and Fred Sauter, The Astronaut Love Show is a cosmic-centric tale of three love stories with a 1970s inspired-score. Andy Peterson is the music director and John De Los Santos directs, The Astronaut Love Show stars Amber Martin as Leslie Starvak, Mark Rinzel as Arvin Meissner, Samantha Stoltzfus as June Bernice McNealy, Nick DeMatteo in multiple roles, Injoy Fountain in multiple roles, and Ross McCorkell as Astronaut Bobby Olofsson, the cannibalized Berndt Brockhaus and Mormon missionary Kip Swanson. Another earth-defying production is That Physics Show, an evening of scientific magic, created and performed by professional physics demonstrator David Maiullo at The Playroom Theater through January 2, 2016. That Physics Show demonstrates awesome feats of physics, from sound waves, density, fluid motion and momentum on to light waves and temperature. It’s not magic! It’s science. After a sold out run, That Physics Show, the production has moved to the 180-seat Elektra Theater for an open-ended engagement. Previews begin on Friday, February 26th and the Opening Night is scheduled for Wednesday, March 9th. For more information, please visit www.ThatPhysicsShow.com. Playing on Air, a public radio show featuring recordings of select contemporary short American plays, returns to BRIC House for a third season of performances. Nine short plays by notable American playwrights (three per evening) will be (or have been) recorded live at BRIC House, downtown Brooklyn on October 20, 27 and December 7 at 7:30pm. The live performances feature, among others, Willy Holtzman, Warren Leight and David Auburn, (December 1). Each play is followed by an interview with its playwright, director and cast. The evenings are moderated by Claudia Catania, Playing on Air’s founder and producer. Performers for the series have included Bobby Cannavale, Chris Cooper, Hope Davis, Jesse Eisenberg, John Leguizamo, Jane Krakowski, Audra McDonald, Debra Monk, Rosie Perez, Jerry Stiller, to name just a few. Over the years and its 17 recorded “sessions,” Playing on Air has produced plays by Lynn Nottage, Beth Henley, Christopher Durang, David Lindsay-Abaire and David Ives, to name a few of the playwrights represented. On December 7th, the program will include The Wonderful Thanksgiving Violet by Max Baker, directed by Carrie Preston; 2 Dads by David Auburn, again featuring Bobby Cannavale along with Tony Shalhoub, directed by Claudia Weill, and The Press Conference by Jessica Dickey, directed by Judith Ivey and featuring Paul Thureen, Will Dagger, and Jay O. Sanders. December 11-13, at The 52nd Street Project’s Five Angels Theater, Bobby Cannavale joins Edie Falco, Frank Wood and other accomplished actors to perform in Larger Than Life: The Supersized Plays, the Project’s Fall 2015 Playmaking show of plays written by kids. The 52nd Street Project makes a difference in the lives of countless Hell’s Kitchen (Clinton) kids by pairing them with theater professionals who mentor them through the creation of original theater. Larger Than Life features the works of ten-year olds new to theater. The novice playwrights present their work to the public for the first time in this celebration of The 52nd Street Project.The kids writing the one-acts are Lauren Amador-Cruz, Lily Kuzminski, Ayman Musa, Bryanna Ohene Kari-Kari, Leonel Perez, Derek Rey, Selena Sanchez, Gage Simmons and Beyonce Thomas. Through December 20th at Theatre Row’s Lion Theatre, Our Friends The Enemy is an inspiring story of the Christmas Truce on The Western Front in 1914. Not even a World War could undermine the morale of soldiers who wanted to celebrate a season of peace. Private James Boyce tells a very different kind of Christmas story, of how, on a frigid Christmas Eve of World War I, some British and German soldiers stopped their fighting and emerged from their trenches to spend Christmas together. They sang songs, exchanged gifts and even played a friendly game of soccer. Gender identity is a fraught subject, or it can be. Unless you’re Paige (Kristine Nielsen) in Hir, at Playwrights Horizons, now extended (for the third second time) to January 3rd December 20th, who exuberantly celebrates the “paradigm shift” in her family, and posts the alphabet of sexual orientation and identification to her fridge. In Hir, the superb new play by Taylor Mac, Isaac (Cameron Scoggins) comes back from a war zone to a home he doesn’t recognize. Isaac is a sad, unsettled soul, with few prospects, even of inheriting his own birthright. Isaac rails against his mother’s mistreatment of his father, much as Hamlet in another time and play, objected to Gertrude’s mistreatment of his father, the King. Paige is mercilessly unsentimental. Nielsen, as is usual for this terrific actress, has serious fun with this serious and seriously funny role. She parses every sentence to give Paige her hard-won power. Paige may have miscalculated the support she can expect from Isaac. David Zinn has made a wondrous to behold thunder-struck set for Isaac to tidy for Hir. respect. Under Niegel Smith’s direction, the ensemble is flawless. Hir is a marvelous and must-be-seen play. Next up at PH: Jordan Harrison’s Marjorie Prime, directed by Anne Kauffman and starring Lois Smith. Enduring the seemingly unbearable with patience and dignity requires a heroic effort the likes of which many of us would not be capable. In the case of the back story to Allegiance, at the Longacre for an extended run, all Japanese- Americans were called upon to show remarkable forebearance as they were rounded up and imprisoned. After Pearl Harbor, our country, in a pique of paranoia, behaved ignobly toward its citizens of Japanese descent, marking them as de facto enemies. Allegiance is based on a true story, and inspired by one of its stars, George Takei; there were 120,000, Americans of Japanese descent interned under inhuman conditions. America turned on them, while demanding their “allegiance” and loyalty. In Allegiance, Sammy Kimura (Telly Leung), a college student as American as the proverbial apple pie, struggles to make sense of the injustice being perpertrated upon him and his community. He organizes baseball games and dances to bring some light to the darkness of the Heart Mountain Relocation Center. He is itching to enlist in the war effort. Japanese-Americans were not allowed to fight for their country; in fact, they lobbied through Japanese American Citizen League (JACL)-head Mike Masaoka (Greg Watanabe) for the privilege to join up. Many volunteered to serve in the armed forces. His sister, Kei (Lea Salonga), is left behind in Wyoming where she has fallen in love with Frankie Suzuki (Michael K. Lee). Frankie’s sense of honor is to refuse loyalty to a country that keeps his family imprisoned; he burns his draft card. Sammy’s father, Tatsuo Kimura (Christopheren Nomura), has also refused to sign the oath of loyalty and was sent to a labor camp. 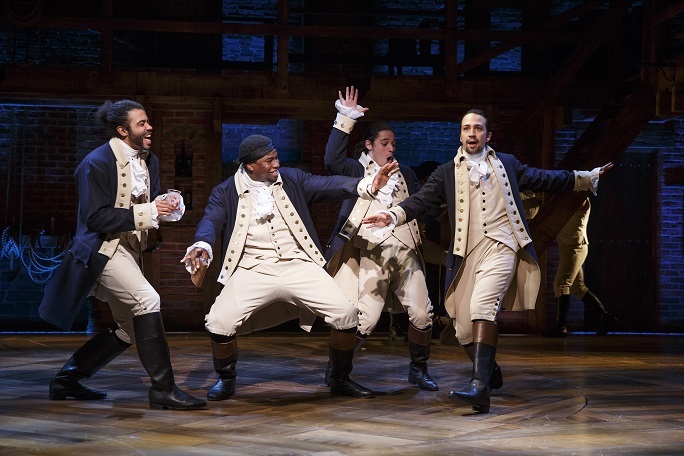 For a chunk of the first act of Allegiance, despite the best efforts of its very capable cast, and the sincerity of the text (book by Marc Acito, Jay Kuo, Lorenzo Thione), it was not easy to emotionally connect to the characters’ plight. Somewhere along the line, all that changed. Suddenly, as Kei and Ojii-chan (George Takei) sang about moving a mountain, (the nicely Japanese inflected “Ishi Kara Ishi,” music and lyrics by Jay Kuo), that connection was formed. At that point, and by the stronger second act, Allegiance exploded as an engaging and moving story. Nonetheless, despite a creditable second act, this story deserves a better telling. A friend recently said, “Everyone has tragedy in their lives.” He was referring to the Gloria and Emilio Estefan backstory to On Your Feet! in this conversation, which should not be too much of a spoiler for their fans; there was the terrifying bus accident in 1990, and some other sadness as well in their lives.But Gloria and Emilio’s story is not defined by tragedy. Like their life, and music, On Your Feet!, at the Marquis Theatre through April 3rd, is about uplift. On Your Feet! opens with a scene from a concert tour and then flashes back. With a book by playwright Alexander Dinelaris, On Your Feet! features the music and lyrics of Emilio and Gloria Estefan, and music recorded by Miami Sound Machine, 5 of whose members are in the band. As On Your Feet! goes back to tell the tale of Gloria’s beginnings, little Gloria (Alexandria Suarez) sends tapes of songs to cheer her father (Eliseo Roman), who is stationed in Vietnam. As she grows up, Gloria (Ana Villafañe) is still singing, and taking care of the household while her mother, Gloria Fajardo (the always excellent Andréa Burns), goes off to school. Gloria’s grandmother, Consuelo (Alma Cuervo) was her biggest booster, urging her to practice her guitar. Keeping the beat in upbeat, it’s the songs and the dancing, with a strong script, that are the big draw here. On Your Feet! features many fabulous dance numbers, performed by the energetic and nimble corps, but none is more impressive than one danced in wooden sandals. Choreographer Sergio Trujillo gives the ensemble, headed by dance captains Natalie Caruncho and Hector Maisonet, plenty to show off. Also impressive is the young Eduardo Hernandez (in all the young boy roles) who gets to show off his “America’s Got Talent” talents and demonstrate why he won the 2014 Latin Dance Cup. The actors, led by the lovely and ebullient Ana Villafañe as Gloria, are all transcendent. On Your Feet! benefits from the imaginative sets of David Rockwell, who uses scrims, and moving screens, as part, but not all, of the stylish scene-making. ESosa’s costumes are lush, colorful and varied, helping to create the timeline of the Estefans’ narrative. Director Jerry Mitchell seamlessly brings together all the elements that make On Your Feet! such a crowd-winning pleasure. The Estefans, Emilio (Josh Segarra) and Gloria, Cuban immigrants who met in Miami, made disco their own from the late 1970s to the late 1980s. Performing originally as the Miami Sound Machine and then as Gloria Estefan and the Miami Sound Machine, the group disbanded except for a brief reunion in 2002. Gloria went on as a solo artist, with Emilio as her producer; over the years they have together won 26 GRAMMY Awards®. On Your Feet! is a grand time, and not just for fans of disco and MSM but for anyone who likes a good musical. On Your Feet! is fortunate in having an intrinsically moving story for its wonderful cast to tell through its well-honed plot and exuberant music/dance. For more information and tickets, please visit http://onyourfeetmusical.com/. 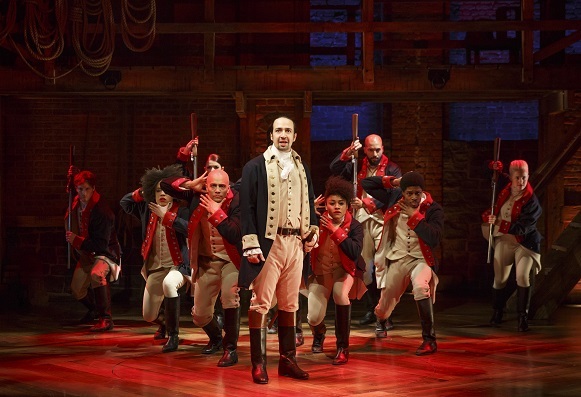 “Hamilton” is still A Perfect 10! 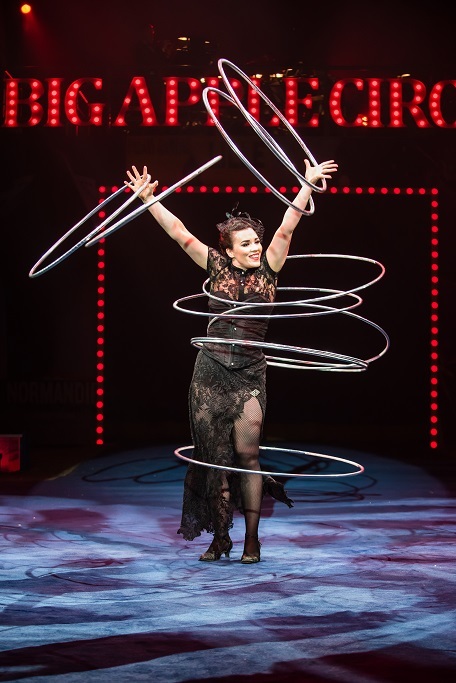 New York City got its own little BIG TOP, when its circus performer founders decided to teach the skills they had honed over the years. 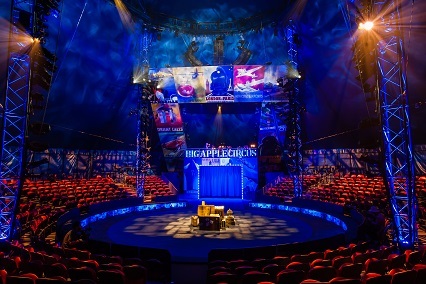 From school to single-tent, in the European style, Big Apple Circus has set up its tent at Lincoln Center each holiday season since 1977. Your kids won’t care about any of that. They’ll be awed by the action in front of them. 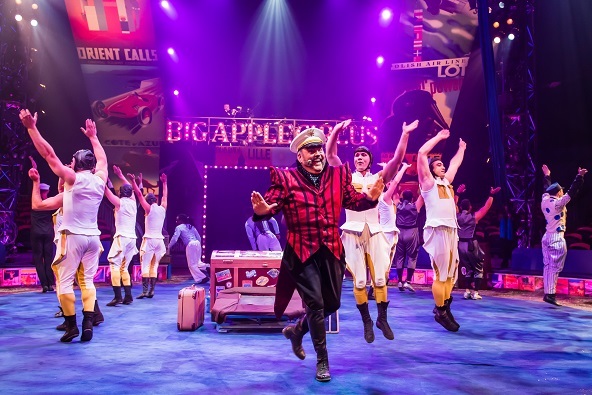 They’ll giggle as Skip (Brent McBeth) gets Mr. Joel (Joel Jeske, who wrote The Grand Tour and also creates and directs clown material for the troupe) soaked and admire the Energy Trio acrobats as they stand on their hands. 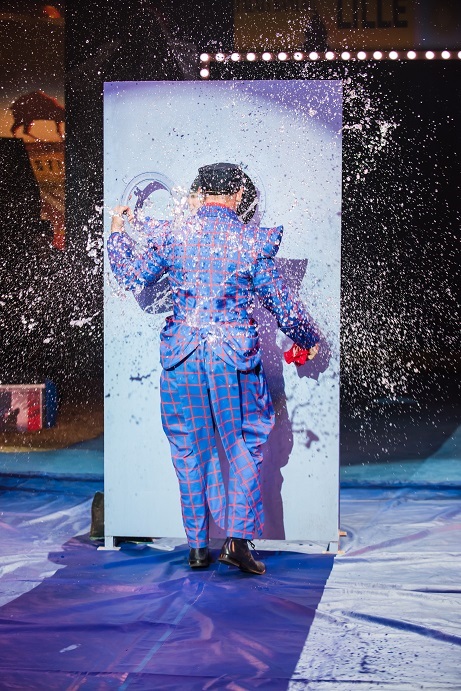 You too will marvel at the talent on display in the new Big Apple Circus: The Grand Tour. Going in, a patron worried at missing the trapeze act, and then watched slack-jawed as Jayson and Eric Dominguez worked the Wheel of Wonder. 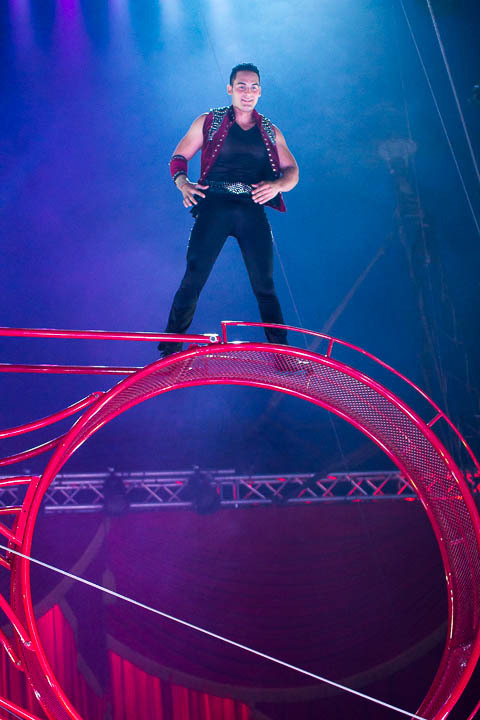 Audible gasps were heard all around as the two men balanced and jumped on high, in two moving rings. BREAKING NEWS: Jim Gaffigan is Guest Ringmaster on November 21st. 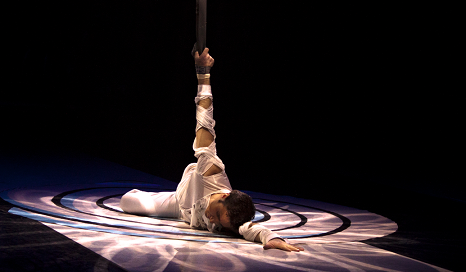 In fact, look for a rotating cast of Guest R.M.s in the tour, and special events like the circus adapted for family members with autism program on November 17th. Jenny Vidbel and Emily McGuire work a dog act (and the ponies, too) with an impressive bunch of canines. Alexander Koblikov, as a slightly askew sailor, juggles as many as 9 balls into his hat and behind his back. 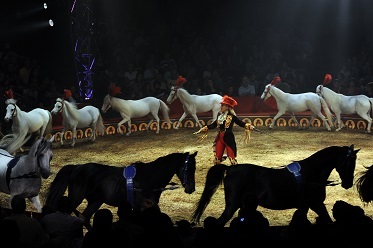 The Ringmaster (John Kennedy Kane) orchestrates The Grand Tour in a booming voice. Much of what is on display could be billed as a vaudeville show. 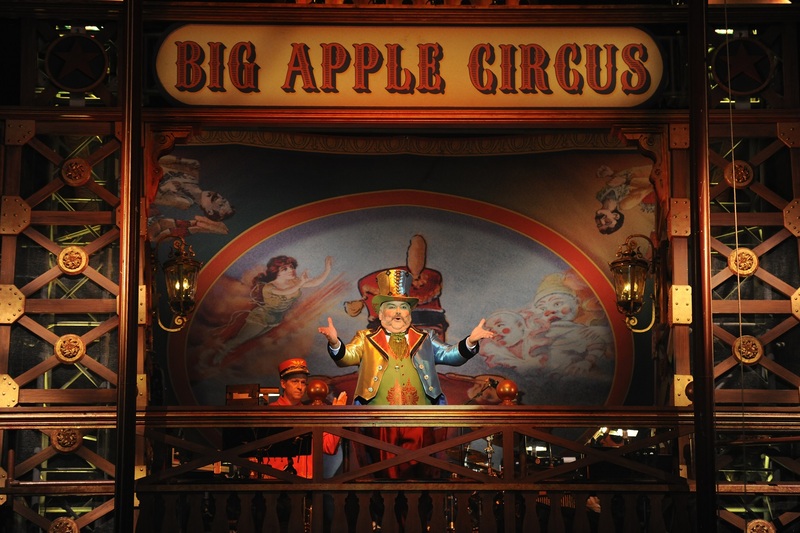 The Big Apple Circus Band, led by Red Slowik, is energetic and tuneful. Enjoy this home-grown holiday tradition, running through January 10th at Lincoln Center’s Damrosch Park. 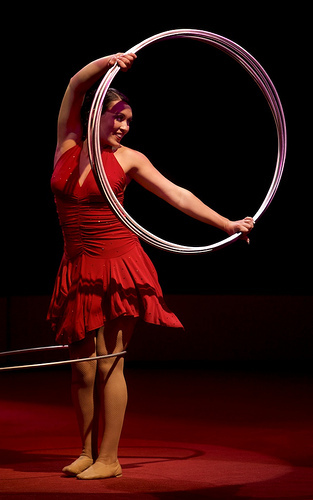 Also see our other postings about the Big Apple Circus season here, and also here. There is also post at our cleanlists.wordpress.com site. Abyss, running from November 7th through December 6th, kicks off The Play Company’s (PlayCo), 15th anniversary season at Theaterlab; Abyss, a poetic thriller with connections to the former Yugoslavia, directed by Maria Mileaf, marks the U.S. debut of the award-winning German playwright Maria Milisavljevic. In Abyss, a young woman named Karla has been missing from her Berlin apartment since Monday. I, She, and He, three of Karla’s closest friends, frustrated by the indifference of the local police, launch a search of their own. From November 5th through the 21st, the Award-Winning Astoria Performing Arts Center (APAC) presents the world premiere production of Cheryl L. Davis’s Carefully Taught, directed by Pat Golden in limited engagement at Good Shepherd United Methodist Church. Carefully Taught centers on the friendship of two schoolteachers–one black and one white. Their bond is shaken when one loses her job, and questions of loyalty and unspoken prejudice rise to the surface, forcing us to examine our perceptions of race. For more information or tickets, please visit www.apacny.org. November 19th, at Theatre Row, for the United Solo Theatre Festival, Dublin-based actor-comedienne Suzanna Geraghty is returning to New York for an unprecedented second encore of her Audience Choice Award winner Auditions, Zoe’s Auditions, about the trials and tributions of the endearing underdog Zoe. For more information or tickets, please visit www.auditionszoes.com. Is it Valentine’s already? Dating: Adults Embracing Failure, written and performed by Josh Lanzet and Lindy Voeltner and directed by Andy Eninger, from November 19-21 at UNDER St. Marks is about discovering how to make it work. Every relationship fails or perhaps it doesn’t. The trick is finding out which one will succeed. Dating: Adults Embracing Failure has a hilarious and thoughtful answer, showcasing eight eclectic couples as they discover if they have the right chemistry, with one unexpected couple emerging intact through it all. At the Brick in Brooklyn, experience the world premiere of the New Georges production of How To Get Into Buildings by Trish Harnetiaux as part of The Brick’s Resident Artist program, from December 3rd through 19th. Katherine Brook directs this exploded view of love, in which confusion reigns, time shifts, amateurs are experts, and brunch can be fatal. Harnetiaux used the structure of the type of illustration or diagram used in manuals (for lawnmowers, bicycles, computers) that shows an object’s parts apart from the whole, but in positions that indicate their relationship to it. In How to Get Into Buildings, Roger and Lucy meet in a convention hall, Daphne and Nick fall apart at a diner, their stories intertwine as the play swirls around you, illustrating alternating views of love and heartbreak. For more information or tickets, please visit www.bricktheater.com or www.newgeorges.org.